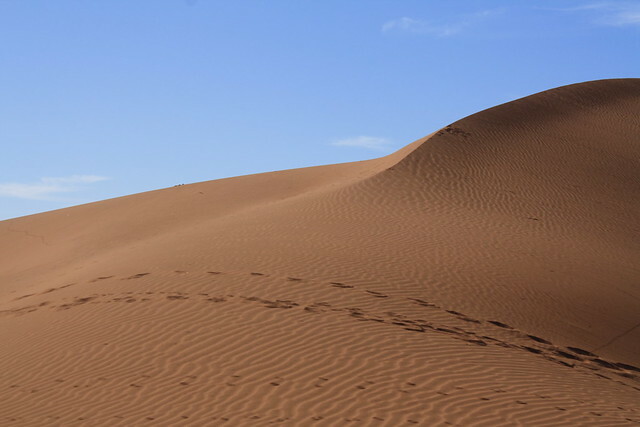 First stop on our Southern African 4×4 safari was the otherworldly and postcard-worthy sand dunes of Sossusvlei. 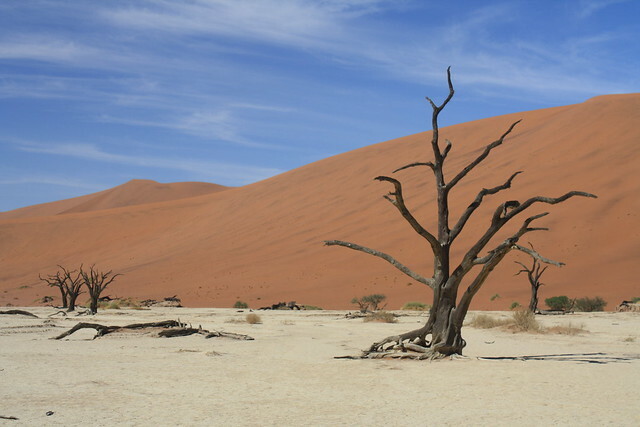 Like many others I had begun to associate the entire country of Namibia with these impossibly beautiful giant dunes and the neighboring “Dead Vlei,” a crazy Dali-like formation of petrified trees creeping their way out of a salt flat in the middle of absolutely nowhere. When I picture Hell, this is what I see. Here is a photographic run-down of our trip to Namibia’s finest attraction. The drive to Sesriem (car problems withstanding) was incredible. Nowhere in the world had we driven so many miles without seeing a single person, not another vehicle, nor home, nor even a sign of life. The final stretch into Sesriem Canyon with the sun setting over the mountainous sand dunes was a picture of the reason why we came to Namibia. We arrived to our campsite after dark, which is when we discovered a very important problem with the vehicle: the lights didn’t work. Now, not only is it dangerous to drive at night but it’s extremely dangerous to drive at night with no lights! We settled in quickly and set up camp. We broke bread (PB&J, really) and grabbed a hot shower to wash away the first day’s troubles. 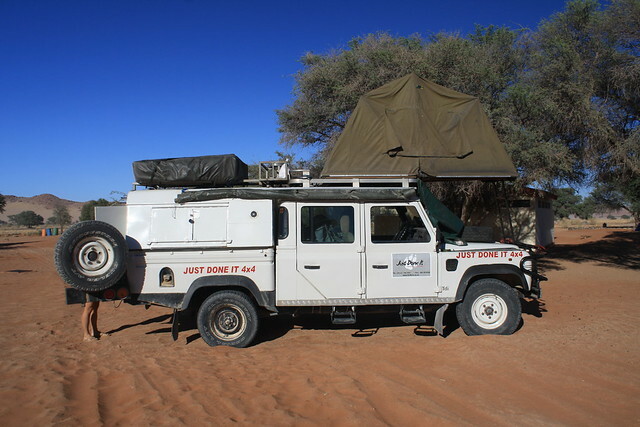 Then it was onto our mobile home and bed on the roof of the Land Rover. Camping out under the stars on our tent atop our car, in the middle of the desert, helped to assuage any misgivings I had about opting to travel independently. Our second day in Sesriem we headed to the famous Sesriem Canyon, a narrow gorge splitting open the earth and running for a mile. The day was scorching hot and we would need plenty of water. The good news is that when you travel with your home your kitchen is never far away. We hiked through the canyon, taking in the desert views and appreciating the crazy rock formations. More interesting is the birdlife and many insects that can inhabit such a forbidding place. 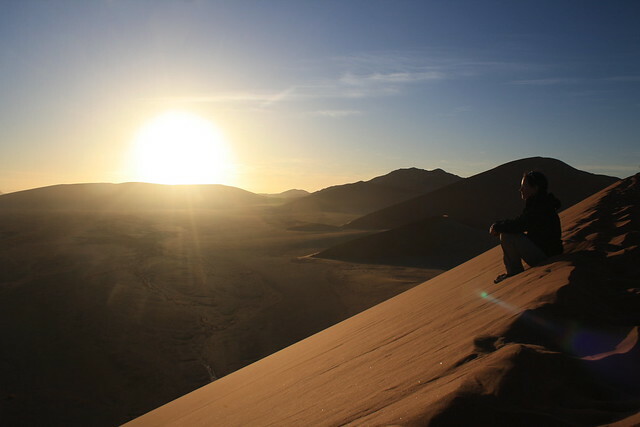 In the late afternoon we headed to Elim Dune to watch the sunset over the Namibian valley. Watching the sun set over the valley floor atop the massive red dune was a serene sight. All around us were mountains of yellow sand glowing red in the fading light of just another day gone by. This was an image that had captured my curiosity from across the world and had drawn me right here to this very spot. 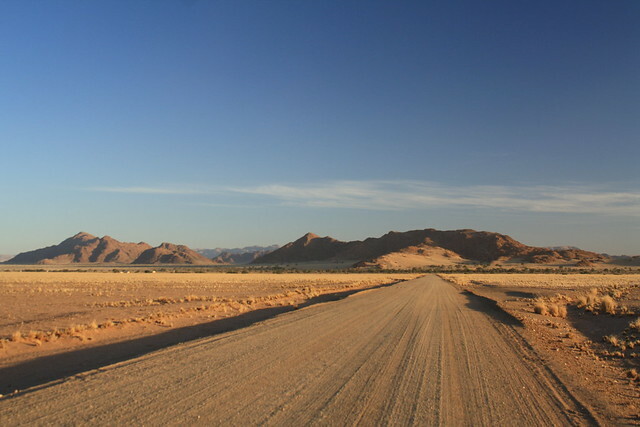 The true gem, however, and reason that so many people from around the world are drawn to this part of Africa is the area of Sossusvlei, 60km away from Sesriem. 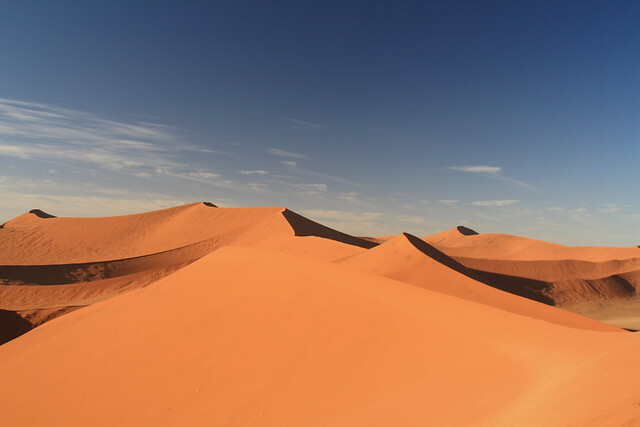 The massive sand dunes of Sossusvlei are best viewed at sunrise or sunset. We decided against our body clocks to start off our day at dawn the following morning. 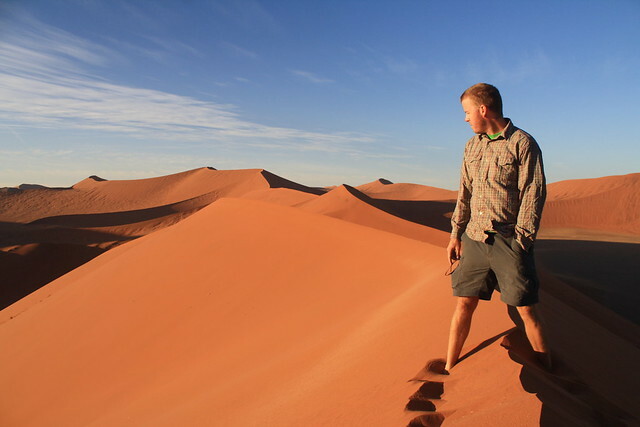 We woke up early, packed up our rooftop tent in the dark, and headed to Dune 45, a magnificent-looking but poorly-named dune, you guessed it, 45km from Sesriem on the road to Sossusvlei. Hands down, this was one of the highlights of our year. 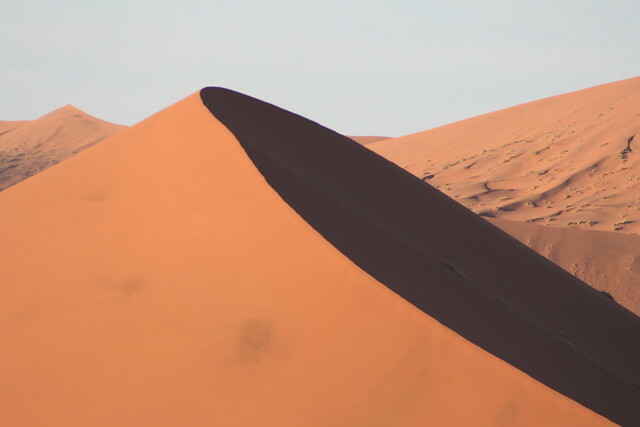 When we arrived to the dune, the rising sun had split the dune in two: the eastern facing half basked in the morning sunlight and the western half cloaked in shadows, still awaiting its share of the sun. 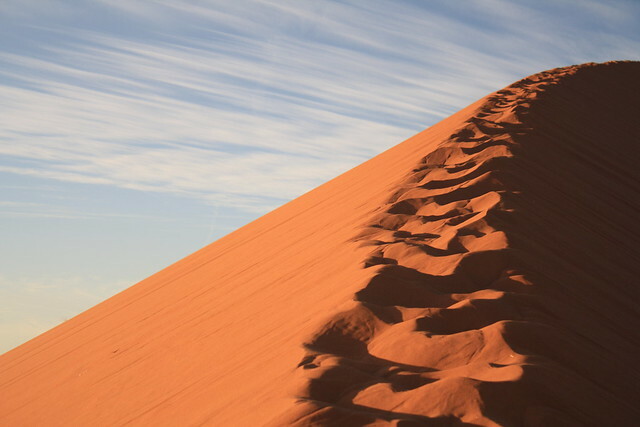 We started up the dune ridge and were instantly entranced by the desert’s dual personality. On the dark side, the sand was cool and felt like I was putting my foot into a pool of cold water. On the bright side, the sand was scorching, even this early in the morning. This felt like my bare feet were being put into a frying pan. The trek to the top took about 40 minutes but the views were absolutely worth it. Taking in the opposite views from the sunset before from atop another sand dune, Laura and I couldn’t help but appreciate the ying and yang dichotomy that takes place here each day. We sat up there for almost an hour, watching the sun creep its way northward and begin to warm the day before we decided the time was right to slalom our way down the dune and head to Sossusvlei’s other otherworldly landmark – Dead Vlei. 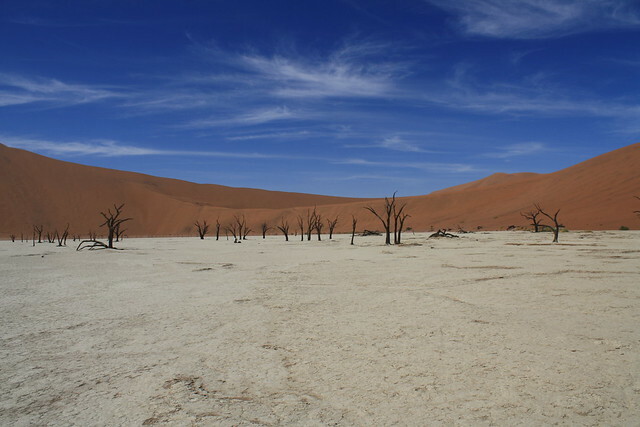 We drove 15km to the Dead Vlei entrance. It was here that we’d first get to put our 4×4 gears to work. It’s a 5km drive through some seriously thick sand to get to Dead Vlei. All the 2×4 vehicles had to park their cars and 4×4 taxi their way there, but not us. 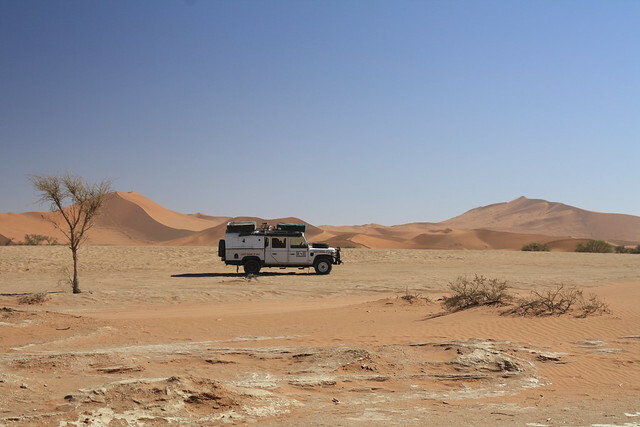 Laura was rightly nervous, as I had no previous experience driving a 4×4 nor any vehicle through thick sand, but I was determined. We had rented a Land Rover for a reason I said. So, I popped the newly-named Sand Lover into 4×4 and put it in second and began to wade the car through the sand. I say wading because that’s exactly what the car does. You give the car some gas and the momentum creates a quasi-wave that carries you through the sand. Several times I felt the vehicle begin to lose momentum and sputter so I had to throw it in first for a jolt and then back into second. This was nerve-racking but the sense of accomplishment a man feels when he reaches his destination is indescribable. We made it to the entrance of Dead Vlei and began the arduous trek through already searing temps to Hell on Earth. The pictures here will do better than any description. We’ve been to many surreal destinations on this trip, but truly none more so than this place. The experience of visiting Sossusvlei certainly met our insanely-hyped expectations and, alone, merited our visit to Namibia. 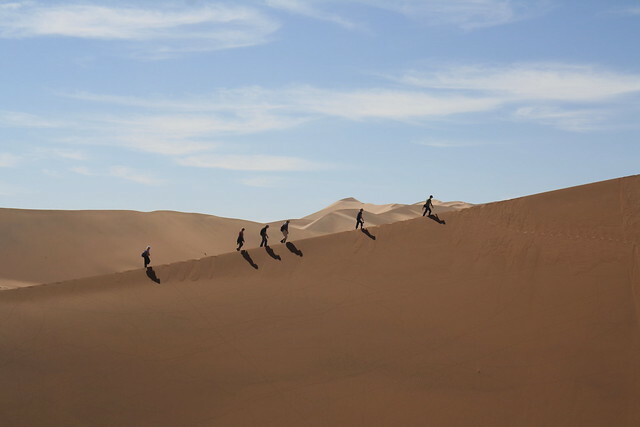 It was then onward and upward to the German town of Swakopmund where we would begin a legendary credit card dispute with our 4×4 rental company and find out the importance of being earnest. Such stunning photos! My husband (Tim) and I have Namibia in our sights right now, and your description definitely makes me want to go sooner rather than later. Also – hi! I came across your blog a few weeks ago and have been really enjoying your stories. I’m looking forward to starting from the beginning of your trip and reading up until now. I wanted to mention that I completely identify with Laura’s most recent post, Homeward Bound. Tim and I went on an 18-month RTW trip in 2005/06, and I remember all too well experiencing the emotions Laura described. We found our “re-entry” into home life again a bit difficult, but what really snapped us out of our post-travel funk was just beginning to travel again. Even if it’s just a weekend or a week away, it helps our bodies/minds remember that traveling doesn’t have to be a one-time thing. If it’s helpful, I wrote a bit about our experience in a post back in July. It’s a story called Coming Home After Your RTW Trip. Maybe there’ll be something there that will help you guys too. I wish you guys well on the last few days of your RTW trip! And again, I’m so so happy I found your blog! Looks incredible! Great photos and well written post – I feel like I’m there with you. Namibia and Botswana are huge on my list, so is trekking Kilmanjaro… so reading your blog right now is a mild form of punishment! Cheers guy. These photos are gorgeous! I’ll be heading to your Flickr to see more!